President Barack Obama’s pick for defense secretary, Ashton Carter, testified before the Senate on Wednesday, facing a grilling from lawmakers on topics such as the Ukraine crisis, the Islamic State, and closing Guantanamo in Cuba. Asked by Sen. John McCain (R-Ariz.) whether the US should supply the Ukrainian army with weapons in order to fight rebels in the country, Carter said he leaned in that direction. Carter also ruled out providing Ukraine with American military personnel, and said that whether lethal arms are provided or not, the US must consider any and all potential consequences. Opponents of arming Ukraine say it could escalate the situation and further deteriorate relations with Russia, which the US believes is supporting and arming rebels in eastern Ukraine. 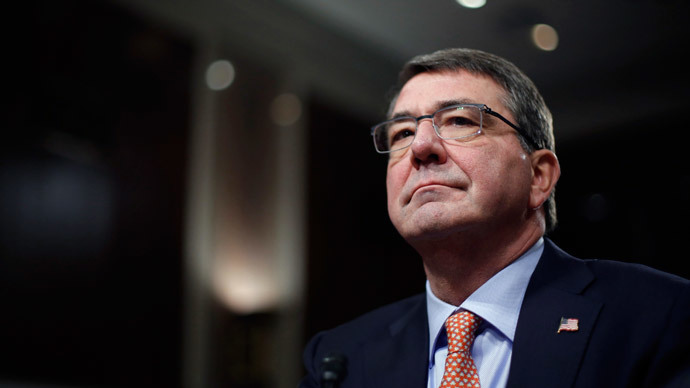 Carter said that sanctions must be the main tool used against Russia for its alleged role in the conflict. “I think the economic and political pressure on Russia has to remain the main center of gravity of our effort in pushing back,” he said. Moscow has denied being involved in the war in eastern Ukraine and has been calling for ceasefire and a dialogue between the Kiev government and the authorities of the self-proclaimed Donetsk and Lugansk People‘s Republics. Multiple lawmakers criticized the Obama administration’s approach to the Islamic State (IS, formerly ISIS / ISIL), with some questioning whether there was a coherent strategy to take on the extremist group. Carter defended the administration, saying US-led airstrikes are an important component in the battle against IS while the military helps train Iraqi security forces, supports Kurdish Peshmerga troops, and builds a capable fighting force out of moderate Syrian rebels. He also promised to quicken the pace of weapons deliveries to Jordan, which wants to boost its effort to combat IS following the execution of one if its pilots. Meanwhile, Carter added that the rebels the US is looking to train in Syria would not only combat IS, but also ultimately help topple the embattled government of Syrian President Bashar Assad. Sen. Lindsey Graham (R-S.C.) questioned the wisdom of the White House's plan, arguing that the US cannot expect Assad to stand back while it trains forces that will eventually target his government. Civil war has been raging in Syria for years, but plans to arm the rebels against IS have been questioned by analysts as well as officials. Critics of the plan argue that the US cannot gauge the trustworthiness of rebel groups, considering they are primarily interested in removing Assad from power, and warn of the possibility of American weapons ending up in the hands of IS militants. As the Obama administration speeds up its plan to close the Guantanamo Bay prison complex, Republicans have expressed concerns over the pace, as well as the possibility that freed detainees take up arms against the US. Sen. Kelly Ayotte (R-N.H.) pushed Carter to “not succumb to any pressure” from the White House to close the facility as fast as possible, particularly since he must authorize the release of any prisoner. Currently, there are still more than 100 detainees being held at Guantanamo. Although President Obama's promise to close the facility dates back to 2008, lawmakers in Congress have blocked his ability to do so and slowed the transfer of detainees. Will Afghan withdrawal be delayed again? Regarding the administration’s plan to withdraw US troops from Afghanistan by the end of 2016, Carter said that he currently supports that plan but could suggest the president change course if conditions on the ground warrant a reversal. Already, the US has announced plans to leave more troops in Afghanistan throughout 2015 than previously planned, though the government maintains that withdrawal remains on schedule.